Waste, including extremely hazardous waste like radioactive material, toxic heavy metals and poisonous PCBs are routinely being loaded into trucks, and transported across continents. Some is loaded onto ships and exported to other countries. Often the waste is being sent for recycling but some is just dumped. 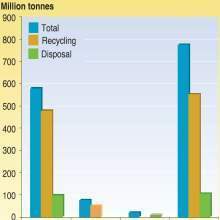 Between 1993 and 1999 122 countries reported nearly 30 000 waste exports. During this period Germany was the top exporter (nearly 7 million tonnes) and France was the leading importer (just over 3 million tonnes).